Oxalis has its place in a shady spot in my garden and then keeps going as a house plant when it gets too cold outside. It’s like an Energizer Bunny: a super easy, non-stop grower. I love the playfulness of the purple triangle shaped leaves that float like little kites on skinny stems. 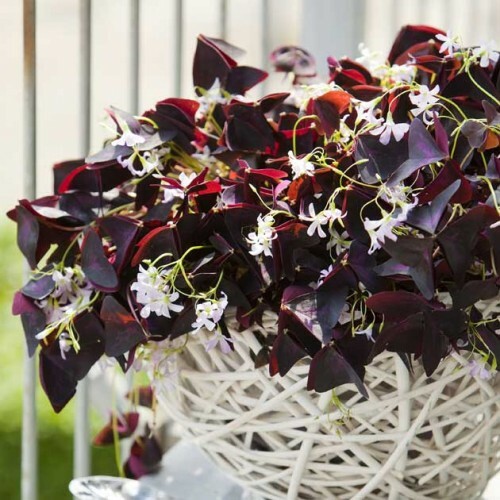 Oxalis triangularis will create a real eye-popping effect with its dark purple, clover-like leaves topped with delicate, pink flowers. Easy to grow and beautiful to look at! Oxalises grow in neat mounds of foliage topped by five-petaled flowers. Oxalis triangularis, or Good Luck Plant, is a mysterious beauty with its dark purple, clover-like leaves topped with delicate, pink flowers. It opens in the sunshine and closes at night or on cloudy days. Native to South America Oxalises are popular house plants but can also be left in the ground in Zones 6-10.